Bleach can cause invisible, irreparable damage by eating away the surface of the stone. Exposed to the elements, bleach can cause the stone to decay at a more rapid rate. Using bleach can also leave a residue that no amount of cleaning and rinsing can remove. Bleach causes a “sugaring” effect on soft stones such as marble. 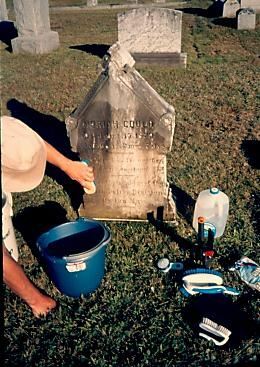 Check with town officials, a Sexton, a Cemetery Association, or descendants to see if permission is required before you begin cleaning. Evaluate the stone’s condition. A stone that is leaning at an angle, that may be loose in its base, that is already cracked, or that shows signs of flaking or of previous repairs should not be cleaned unless the stone has been stabilized. Determine whether the stone really needs to be cleaned. If the engraving is clearly readable, then it probably should not be cleaned. Remember, every time a stone is brushed or rubbed, deterioration to the surface is likely to occur. Bring appropriate cleaning aids: natural or soft-bristled brushes, a tooth brush, soft wooden craft sticks, gloves, kneeling pads, grass clippers, spray bottles, pails, and many gallons of clean water. MOCA does not recommend the use of power washers on old marble or slate stones. 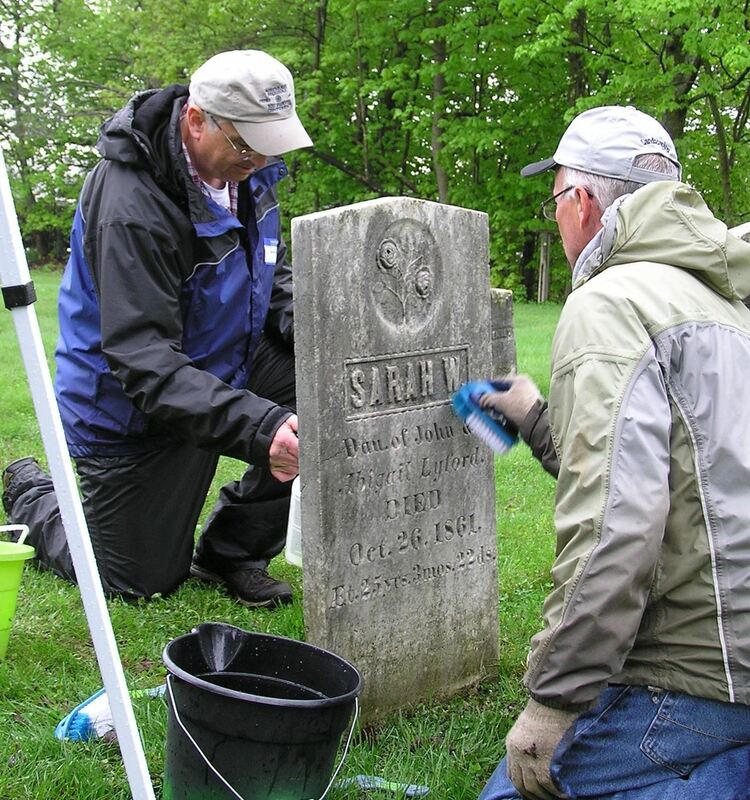 Do no harm – the first step in cleaning a gravestone. Use WATER ONLY to clean stones. Professionals may use other cleaning agents. Remove loose, dry material with a soft-bristled brush. Clean the sides and back of the stone first, then lastly the front. Always wash the stone from the BOTTOM UP to avoid streaking. Use small circular motions as you work. Change the water often. Using dirty water can cause scratching of the stone. Clean out engraved and other recessed areas of the stone with a soft toothbrush or soft wooden craft sticks, if necessary. Finish the cleaning process by rinsing the entire stone with COPIOUS amounts of clean water. A pump sprayer is ideal.